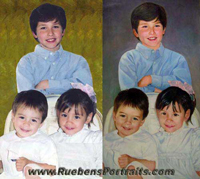 If you want a portrait of different people painted together but dont have one suitable photo then I can compose a portrait from several different photos. The folks in the photo need to be in a similar pose and preferably looking straight into the camera. Send me the photos, tell me what size of portrait youd like and Ill send you a quote within 48 hours of receiving your photos.